So who’s catching a l ift on your shoe? Biological invasions are a major threat to biodiversity conservation and limiting human mediated dispersal of non-native plants and in particular invasive species is an important component of invasive control that needs greater awareness. There is a growing body of evidence pointing to the potential for human mediated seed dispersal by tourists including those undertaking recreational activities. The Otter African Trail Run occurs entirely within a National Park and in order to 1) evaluate the potential for trail runners to transport seeds and 2) to minimise this potential, Kyle Smith ( Marine Ecologist ) and Dr Tineke Kraaij (Nelson Mandela University) from SANParks in collaboration with Magnetic South, implemented the environmental cleaning station during the Otter Trail registration process. Essentially a team of volunteers cleaned and brushed each and every competitors shoes. We saw a range of shoes from squeaky clean to those that were well and truly camouflaged. With protective gloves and a deep breath we tackled them all. After 2 years and roughly 800 pairs of shoes later we undertook a germination trial with all the stuff we had carefully collected. Once the plants had grown to an identifiable stage they were removed from the trial, pressed and sent away to specialists for identification. This is what we found. 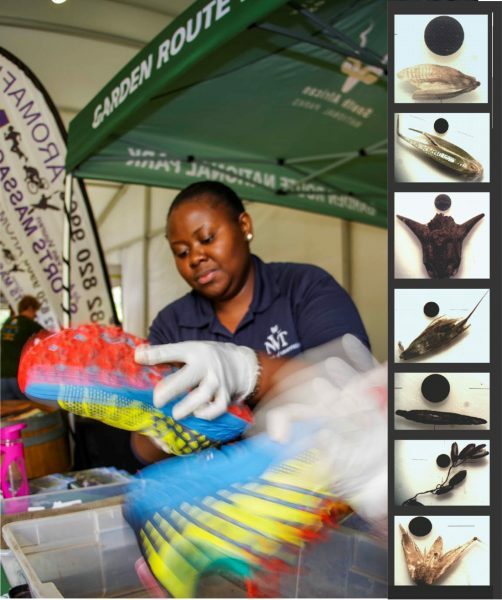 Although the study is no longer being run our results suggest that the shoe cleaning station is beneficial in limiting the distribution of alien invasive plant seeds into the National Park and Magnetic South has continued to support the environmental station. What’s the take home message? That we are all unwillingly transporting seeds around on our shoes and we should be regularly cleaning them to help prevent the spread of alien invasive species.